In a High-Level Panel Discussion on the Coordination Challenges of CRGE Implementation and the Way Forward the following challenges where discussed: What have been the key coordination challenges so far and Recommendations for improved coordination in the future? The panellists stated that all sectors and line ministries have tried to undertake certain activities in relation to mainstreaming the CRGE as per the pm office direction. When it comes to M&E, the institutional set up is there, for e.g CRGE units across each line ministries are set. However, there is a serious national gap in terms of delivery. Starting from the line ministries and regional offices. Some of the plans/ targets are not delivered due to different challenges such as lack of data. Sometimes the data is not representative at national level. ‘There is a need for high level leadership and a sectoral commitment Developing Common action plan’ said H.E. Dr. Gemedo Dale, minister Ministry of Environment, Forest and Climate Change (MEFCC) during the opening ceremony of the conference. This message was echoed by H.E. Ato Belete Tafere (National Integrated Land use planning and policy office) who also stressed the importance of coordination between the line ministries both at Federal and regional level. Per Fredrik Ilsaas Pharo, director of the Norwegian international climate and forest initiative, acknowledged Ethiopia’s leadership with the CRGE strategy and that Norway is proud to support Ethiopia in the ongoing green economy strategy. He further stressed that to achieve the targets, the implementation of the CRGE has to happen at an exponential speed. Mr. Manish Bapna, Managing Director and Executive Vice President, World Resources Institute, gave a presentation on Monitoring sustainable development, focusing on the importance of data for monitoring and evaluation and scale up of different interventions. The need for Building the capacities of regional experts, improving data management and involving other actors from private sector were among the solutions mentioned as a way forward. 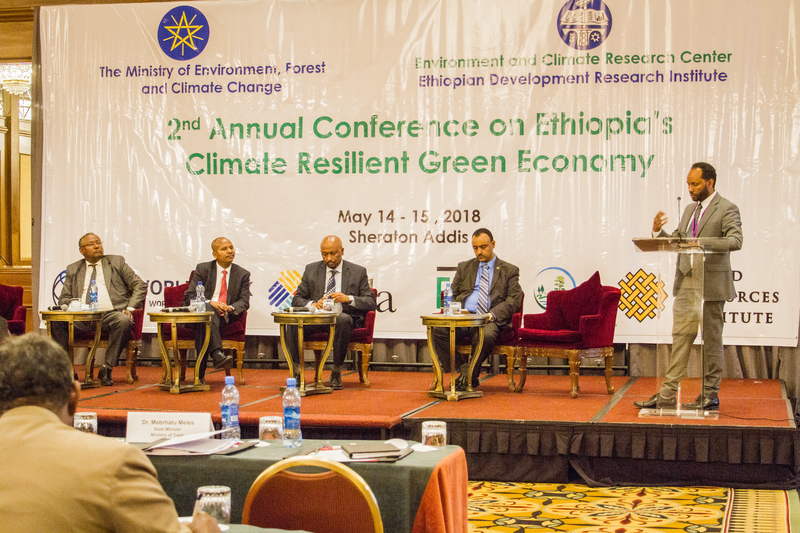 Organizers: Ministry of Environment Forest and Climate Change in collaboration with Environment and Climate Research Center based at the Ethiopian Development Research Institute and the World Bank.